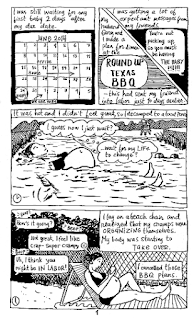 Elise Dietrich is in that cohort of autobiographical cartoonists that includes Glynnis Fawkes and Jennifer Hayden--women who started to do comics as a kind of second act in life. Dietrich has actually done work at the Center for Cartoon Studies, and these minis show how quickly the confidence in her line has progressed thanks to a great deal of work. Looking at the work in Pine Pitch Perfume, for example, one can see that her character design is a little shaky. Balancing space in her panels is also an issue at times, leading to some clutter. That said, she has a keen observational eye and a low-key wit. Her storytelling is also excellent throughout, especially when paired with an interesting conceptual gimmick. 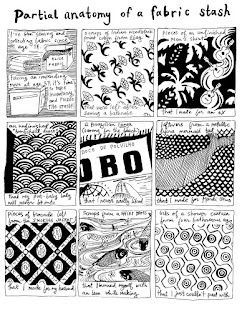 For example, "Partial Anatomy Of A Fabric Stash" uses a nine-panel grid with a different pattern of fabric in each panel. 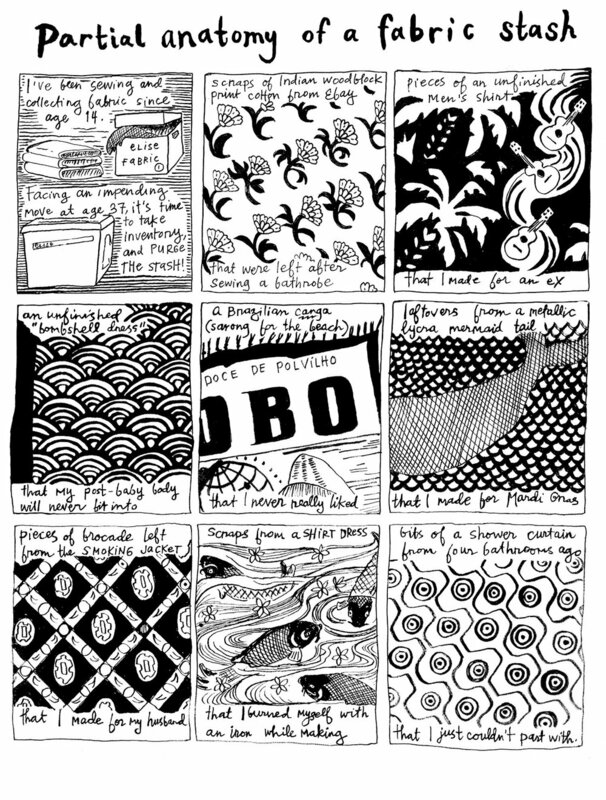 Each pattern told a different story, with a different piece of her past by way of clothes she made or wanted to make. She also told stories about her daughter, her dog, her childhood and traveling to Brazil. Dietrich wields narrative captions pretty hard in these comics, but even her earliest stories have a witty visual vocabulary as well. In panels where her daughter is trying to fool her into staying awake or where she's trying to listen to headphones on a plane and draw but keeps getting loudly interrupted, Dietrich's use of gesture and exaggeration makes those panels effective. Birth Story unlocks and unleashes Dietrich's easy charm as a storyteller in a story that's paced a little like a Summer Pierre comic, only with much more rubbery visuals. Like any kind storyteller, the charm of this piece lies in its details. For example, Dietrich refused to wear any clothing while waiting to give birth. The lactation staff was away when she gave birth because they went to a Jimmy Buffet concert. Those details allowed her to connect the reader to the wave of emotions she felt at different points. Dietrich mostly stuck to a grid in this comic but wasn't afraid to modify it, collapsing rows into a single image or making single panels into a mini-four panel grid. Key West Diary is Dietrich's longest and best comic to date. 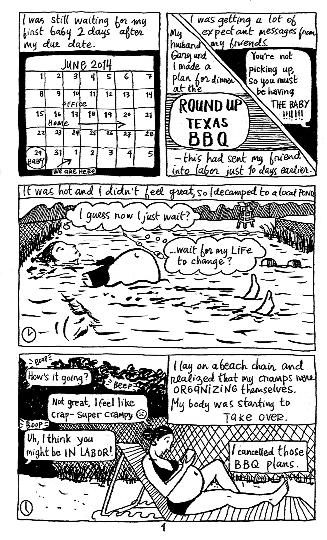 Travel is usually good fodder for diary comics, given the narrative aspect of having a finite period of time one's writing about. Dietrich went the extra mile but traveling alone with her toddler daughter down to her old stamping grounds in Key West with old friends. That gave the comic an interesting emotional resonance, as Dietrich revisited not just an old place, but an old way of life. There's also the New Hampshire in winter vs. sunny paradise juxtaposition, which led Dietrich to increase her degree of difficulty by going out as much as possible with her daughter. There's some disconnect on her part with her friends, who rarely think about their scandalous adventures with Dietrich, especially since she was trying to prove to herself that motherhood hadn't changed her that much. This is a rich and detailed comic that sees Dietrich examine her past, present, and future as an individual apart from her marriage. Her line is expressive and loose as spontaneity was a key aspect of the diary, yet there's greater overall control. The ambitiousness of her trip was matched by the ambitiousness of this comic.